ST. JOAN OF ARC was founded in 1921 with Fr. Alphonse Smith (1883-1935) as the first pastor. The parish was named after the fifteenth century heroine of the Hundred Years War who was canonized a saint only the year before. Bishop Joseph Chartrand had seen the need for a new parish to serve the families who were moving north beyond the reach of SS. Peter and Paul Cathedral. Worshipers were drawn from a large but sparsely settled area extending eastward to Keystone Avenue and north to the Hamilton County line. The original church was quite small, built in Spanish mission style. Parish numbers grew so quickly that a building committee was soon appointed. The large church that now serves the parish, built in Roman basilica style, was completed in 1929. Construction of a school was begun almost immediately. It opened in January of 1922 and was enlarged in 1928, again after World War II, and most recently in 2001. Parish membership kept up its rapid rate of increase. The total reached nearly 5000 before Christ the King, a new parish was created in 1939, which drew away some St. Joan of Arc members. After World War II, the large numbers of children born to veterans and their spouses caused enrollment in St. Joan of Arc School to rise to a peak of just over 1000. Then came the startling and massive social changes in the 1960s that resulted in great numbers of parish members moving northward, out of St. Joan of Arc parish boundaries. The area’s newcomers, many of them black, had relatively few Catholics among their numbers. This gave parishioners the opportunity to share their faith as true Christians, and make the school an oasis of opportunity for all. Equally significant was the growth in faith brought about within the parish members who remained to help usher in true integration. St. Joan of Arc is still an open church, welcoming all who enter its doors and its community. A commitment to hospitality and evangelization keeps St. Joan of Arc true to Jesus’ call and to its mission. Parishioners look forward to a bright future with faith, hope, and love. Our first Church, built in Spanish Mission style, was located at Ruckle and Park and was constructed in 1921 after the designs of architect John Hagel. It was dedicated on July 17 of that year. 1921 also saw the construction of the parish school at Park and 42nd Street. The parish soon outgrew the little mission church as the number of parishioners nearly tripled between 1922 and 1925. On May 1, 1928 a building fund was initiated to finance construction of the present church. Plans for the church quickly came to fruition. The ground-breaking took place on November 6, 1928 and the cornerstone was laid twelve days later. On December 29, 1929, St. Joan of Arc was dedicated. Chicago architect Henry J. Schlacks designed St. Joan of Arc after two basilicas in Rome. He had designed numerous churches in Chicago after Roman models. The design of St. Joan of Arc reflects the wishes of the pastor as well as the scholarship and design talents of the architect. Pastor Msgr. Maurice O’Connor (1884-1939) rejected the use of the Gothic style for the new church because it was employed in the design of nearby Protestant churches. He desired a distinctive landmark for the Catholic parish. The pastor’s dreams were satisfied with Schlack’s design for a large limestone Roman Basilica with a massive green tile roof, portico and campanile. The architect was inspired by the Church of Santa Pudenziana near the Roman Forum for the design of the 140 foot high campanile (bell tower) and by the Basilica of St. Paul Outside the Walls for the façade, portico, and interior. The church interior is divided into four elements: nave, aisles, side chapels and sanctuary apse. The nave is defined by 22 solid Bedford limestone columns capped with composite order capitals. The colonnades support the arcades and the clerestory level above. Dominating the interior of the church is the high altar made in Pisa, Italy from selected marble. The design of the altar and the mosaics are originals of Henry Schlacks. The baldachin – or – canopy – is made of marble and mosaic, supported by six Breccia marble columns. The baldachin has a gold inlaid ornamental gable, a gold mosaic barrel – vaulted ceiling and a glass picture of St. Joan of Arc and St. Michael the Archangel under the rear arch. The free-standing, 14 foot high crucifix holds a marble figure of Christ. Following the Second Vatican Council changes to the liturgy of the Mass, a new altar of sacrifice was placed before the high altar, permitting the celebrant to face the congregation. The church was redecorated in 1950 by the Passalaqua Studio of Cincinnati. On the ceiling over the main body of the church, the fountain with four streams represents the four main sacraments most generally received by lay persons: Baptism, Eucharist, Reconciliation, and Confirmation. The peacocks represent immortality. Above each of the large pillars, along the side of the church is a painted roundel. These symbols represent the human journey through life, using God’s Word and Sacraments as a guide and strength to achieve the human purpose: union with God in heaven. The apse ceiling is painted with symbols of the Holy Trinity, Holy Eucharist, and the earth. The stained glass windows are the work of the famous studios of F.X. Zettler of Munich. The pictorial windows along the aisles depict the saints and episodes in the life of Christ. The windows in the apse behind the high altar depict symbols of the seven sacraments: Baptism, Reconciliation, Holy Orders, Eucharist, Confirmation, Matrimony, and Anointing of the Sick. The fourteen Stations of the Cross on the nave walls are the work of M.L. Lanninger of Munich. The two side altars devoted to Mary and St. Joseph are adorned by their mosaics. 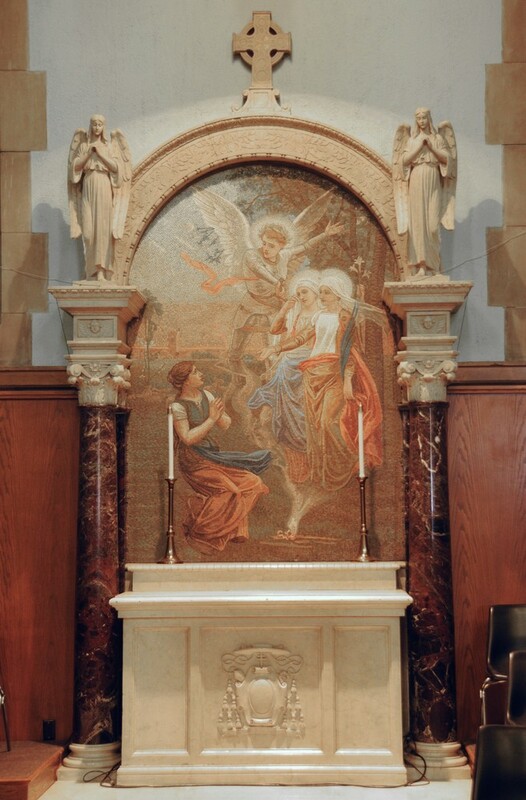 The two side chapels bear mosaics depicting St. Michael the Archangel and St. Joan of Arc at her visitation by Saint Margaret, Saint Catherine and Saint Michael the Archangel. The daily Mass Chapel, a separate room off the apse, was refurbished in 1990. Originally, it was a sacristy for altar boys. The school was constructed in four phases – 1921, 1928, 1954, and 2001 – with the 1921 portion designed by the famous local architectural firm D.A. Bohlen and Son. You are welcome and encouraged to visit our Church and school.